Please understand that the thorough explanation of the following terms and conditions is for everyone's benefit. Past experience has shown that everyone feels more comfortable when much of what is expected is out in the open. We apologize for any inconvenience these policies may cause. The most common method of guaranteeing reservations is with a credit card number that is checked for available funds in the amount of 25% of the rent which are then reserved (pre-authorized.) That card can then be used for payment at check-in if desired. Otherwise, payment can be made with checks, cash or other credit cards. Receipt of an approval number on a credit card constitutes a binding contract for the reservation dates between Prescott Cabin Rentals and the cardholder. Advance payment-in-full by check can also guarantee reservations. If the check has not arrived within 3 mail days the reservation is put on "tentative" status. Checkin starts at 4 pm and checkout is by 11 am. Sometimes early checkins or late checkouts can be accommodated for a small fee. Please call or email the night before or morning of checkin/checkout to see if it is possible. We cannot guarantee early checkins or late checkouts in advance. Dates can be reserved tentatively without cancellation obligation by leaving telephone numbers on file. Tentative reservations allow for final checking of schedules and with companions. Dates will be held until other parties show interest in them. At that point, the tentative reservers will be contacted and have 2-4 hours to guarantee or give up those dates. It is appreciated when tentative reservations are released if there is no further intention to guarantee them. A 25% cash deposit is required at check-in if a credit account cannot be verified. If the accommodation is left in a satisfactory condition (dishes and utensils properly cleaned, no pet damage or droppings, no tobacco odors, key left inside with doors locked and furnishings in order) this deposit is completely refunded (other standard cleaning fees are not refundable.) We expect the condition of the accommodation to be the same after rental as before except for normal housekeeping. While most Vacation Lodging accommodations are suitable for children and pets, some have greater restricions than others. Pets are allowed inside as long they are not left alone in the accommodation when you are not there. They can be confined in a traveling crate if they will not bark (if this would disturb neighbors etc.) They have to be supervised at all times so they do not scratch, chew or do their business on the nice furnishings. They are not allowed on the furniture unless you have brought a suitable pet blanket for them to lay on (please do not use bath towels, sheets, blankets or other items not intended for pet use.) It can be very difficult to remove pet hair from furnishings. You will be responsible for any unusual cleaning expenses, especially urine stains and odors. Children must be supervised at all times. Smoking is only allowed outside. Smokers must be careful about smoke drifting inside. All smoking materials (butts) must disposed of properly. Parents, pet owners and smokers are responsible for any unsatisfactory events or conditions. 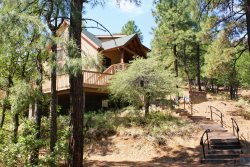 Because Prescott Cabin Rentals accommodations are never overbooked and guaranteed reservations take accommodations off the market, cancellations and changes are sometimes hard to re-book. Some dates always get reserved in advance and there may be few last minute calls. There is a 25% fee for any cancellation or change. If the cancellation or change is made within two weeks of check-in or the party no-shows the full amount is due for any dates the accommodation is not re-booked, in which case the 25% fee is still due. We will make every attempt to re-book all cancellations, no-shows and changes. If the roads to accommodations are officially closed reservations will not be enforced. All properties are privately owned. We reserve the right to immediately evict without refund of payment or deposit ... if the property is used for any unlawful purpose if the property is used for house party, wedding or reception without permission a reservation is made under false pretense if, in our judgment, your occupancy is detrimental to the property. We reserve the right to enter the premises at any time for the purpose of inspection, repair, management or showing to prospective guests or buyers. We will make reasonable efforts to advise guests of these visits. We do not guarantee any appliances. No refunds will be given for malfunctions but we do promise to get them repaired as soon as possible. Every effort is made to fully describe properties and maintain reasonable cleanliness standards but refunds will not be given for dissatisfaction of location, style, layout, state of cleanliness etc. We reserve the right to correct mathematical errors made in rate or tax calculation. The total number of persons allowed in unit or on property cannot exceed the number in the Terms on the CONFIRMATION. No RVs, tents etc. are allowed without permission. Guests are responsible for getting to the property unless routes to the property have been officially closed due to weather, maintenance etc. This includes roads not regularly maintained. PTE, LLC dba Prescott Cabin Rentals, Lynx Creek Farm, LLC dba Lynx Creek Farm and individual property owners are not responsible for any losses due to theft, items left behind, accidents or injuries to guests or visitors due to negligence or lack of personal responsibility. By renting this property, you are assuming all risk and liability for any damage done to person or property, agents, employees or visitors occasioned by the present or future condition of the premises, both latent and manifest. If a reserved accommodation is not available due to conditions beyond our control we will refund all deposits and make every attempt to find alternate lodging but will not be liable for any pecuniary or compensatory damages. We are not responsible for any losses due to theft, damage, items left behind after checkout or injury due to negligence or lack of personal responsibility. We reserve the right to refuse service to anyone.